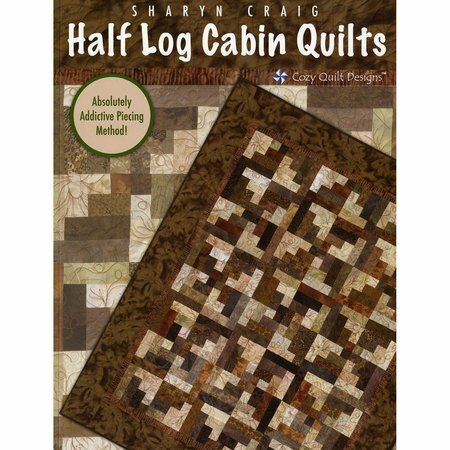 This Half Log Cabin Quilts book by author Sharyn Craig will make you fall in love with the Half Log Cabin quilt block! Sharyn loves to take a traditional block and see how many different quilts she can make using it. She also likes to try to find easier and more efficient ways for piecing these blocks. She has been perfecting this fantastic and versatile block for many years and now joins Cozy Quilt Designs to bring you this wonderful new book. The instructions and step-by-step illustrations are clear and concise so, if you follow the steps you'll make quilts in record time! This book includes tons of unique design ideas for using this fun block. You'll find yourself always wanting to have Half Log Cabin blocks on hand so you can put together a fast quilt when the need arises. You may even find yourself wanting to add Half Log Cabin blocks to every quilt you make!